This book explores the phenomena of both Political Catholicism and the growth of Euroscepticism across Eastern and Western Europe. It focuses in particular on Political Catholicism in Poland, but sets this in its wider European context. 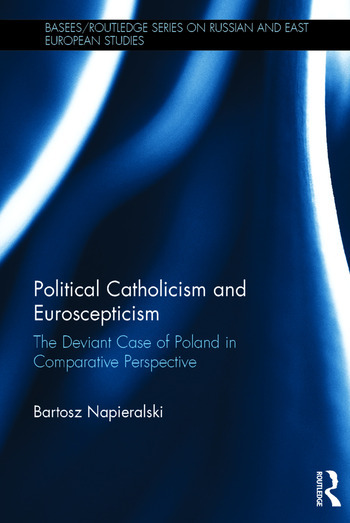 It examines the nature of Political Catholicism as a political movement, discusses the circumstances in which Political Catholicism, which has traditionally been pro-European, can turn to being Eurosceptic, and argues that Political Catholicism in Poland is a special case because of its Catholic-nationalist nature. The book concludes by assessing the role religion plays in the politics of modern Europe and outlines the implications for the future studies of European integration. 6. Political Catholicism and Euroscepticism – the deviant case of Poland? Bartosz Napieralski completed his doctorate at the University of Sussex, Sussex European Institute, UK.